Broadcast on: kykNET, kykNET NOU! Republiek van Zoid Afrika is a South African late-night talk show produced by Brainwave Productions and hosted by rock musician Karen Zoid which takes on the format of a classical late night talk show, complete with satirical skits, musical interludes and entertaining interviews with interesting and diverse guests. Karen Zoid, best known as a rock singer with hits like "Afrikaners is Plesierig" and "Engel" makes the transition to talk show host on kykNET. 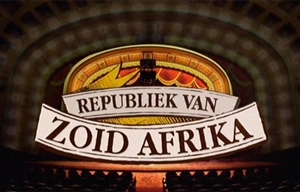 Welcome to the Republiek van Zoid Afrika, kykNET's late-night talk show where Afrikaners are plesierig! In the RZA, Karen Zoid chats and banters with her country's favourite thinkers, dreamers, decision makers and other brave, crazy and remarkable people – in Afrikaans and English. The Republiek Van Zoid Afrika takes on the format of a classical late night talk show, complete with satirical skits, musical interludes and entertaining interviews with interesting and diverse guests. The release of her first solo-album (Poles Apart) 10 years ago fired the imagination of both critics and the public when Karen Zoid bursts onto the scene with the song Afrikaners Is Plesierig. The song became iconic and Karen Zoid became South Africa's queen of rock, crossing over between Afrikaans and English markets. TIME Magazine and US News & World Report highlighted her role as icon in the South-African market. A unique aspect of the show is that it has been facilitated by the recently launched MagnaTude Studios & Post – Cape Town's first high definition studio where the show is set in a 360-degree configuration. Karen and her guests are positioned in a triangular formation consisting of a couch and two armchairs. Cameras are positioned all the way around the lounge setting, carefully hidden. A "backstage" setting is created through the use of musical instruments, cases and amplifiers that are visible in the background. The audience is also visible in the background behind the couch, which adds to the intimate atmosphere of the show. Each episode closes with a duet between Zoid and one of the guests. Famous names in these collaborations include Laurika Rauch, Dorothy Masuka, Zolani Mahola and Kurt Darren. Also included in the show are comedic skits featuring Esther von Waltzleben, who joins Karen to create some very memorable and familiar characters. Look out for "Boereraad vir Bands" and a new pan-flute CD called "Holriete". The Presenter Search on 3 kicks off tonight, with returning seasons of Republiek van Zoid Afrika and Real Housewives of ATL. Karen Zoid's kykNET talk show has been renewed for two seasons. She tells TVSA why she thinks the channel's ordered more.